Since its founding, immigrants continue to flee oppression to come to the U.S., but at a cost. For many, the equation tips in favor of the opportunities available in spite of almost certain culture shock as they work to adapt to the prevailing ways that are so different from the lives they knew back home. Margy Kahn’s first full-length play, “Familiar Strangers”, currently in production at The Pear Avenue Theatre in Mountain View, is a story she needed to write to counter the demonization of Middle Eastern, and particularly Iranian, immigrants in this country. Born of her experiences from the year she spent in Iran prior to the overthrow of the Shah while she was a linguistics graduate student, she tells a realistic story about Massoumeh (Sharareh Mehrinfar-Bass), an Iranian immigrant questioning her choice 12 years earlier to stay here in the U.S. to raise her daughter instead of returning home with her now-estranged husband Ali (Kevin Copps) during the Iranian revolution. The story begins in 1991 in Massi’s apartment where she lives with her 15-year-old daughter Donya (Emma Levine-Sporer). Massi’s long time friend Sally (Helena G. Clarkson), an American fond of Iranian culture, is a frequent visitor. 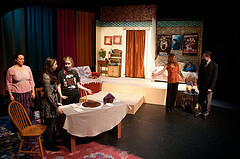 At present, Massi sees Donya’s friend Carissa (Megan Putnam) as a bad influence on her rebellious teenager when Sally brings the girls home after they were caught shoplifting. At first blush, Massi may be right given Carissa is a cigarette smoking, heavily pierced punk-rocker, and a kleptomaniac who seems out to prove something, though it’s not entirely clear what that might be. In spite of the minor shoplifting incident, Sally tries to convince Massi that she needs to stop smothering Donya and let her find her own way. In the midst of the current turmoil, after having spent many years in prison following the revolution, Ali turns up, now sent by the Iranian government to deliver a technical paper at a local conference. He contacts Donya, but the two get their wires crossed in coordinating a meeting time. There’s far more to the story including the root of Ali’s and Massi’s estrangement, along with some flashback sequences later in Act 1 taking us to when Ali and Massi first came to this country. At present, they both express concerns over Donya’s “Americanization” thinking this puts her in danger as they consider whether, after all this time, they should send her back to live in Iran where she’d be safe. Though it seems difficult to imagine how a western, rebellious, teenage girl could be safe in Iran in the present climate, the conflict arises when Ali demands they send her back, while Massi maintains that it’s ultimately Donya’s decision. Jeanie K. Smith and Diane Tasca share directing credit and collaborated closely with Kahn in bringing this production to fruition. Mehrinfar-Bass, who has also been working with Kahn over the last two years, captures Massi’s anguish and inner conflict. A native Persian raised and educated in Iran, she portrays her character honestly, torn between pursuing the opportunities available in the U.S. and the old traditions she left behind. There’s no hesitation in her performance, and her emotions and delivery feel authentic. Mehrinfar-Bass’ scenes flow very smoothly, but when she’s not in a scene, the other actors sometimes aren’t quite as realistic in their presentation. That should smooth out some as the run continues and the rest of the cast becomes more comfortable with the story’s flow and with audience reaction. Levine-Sporer as Donya is credible though she seems a little unsure of some of her character’s moodier moments, particularly with Putnam, softening them a bit too much. Her scenes with Mehrinfar-Bass are her best, and she’s quite natural in them. With Copps, we can believe that Donya’s a little frightened since she clearly doesn’t know her father, so Levine-Sporer’s hesitation there is appropriate. Clarkson reads almost as though she’s not entirely comfortable in Sally’s skin, and she adopts an almost schoolmarm-like demeanor which seems out of place. She may relax some as the run continues, though she is convincing when Sally first tries to reason with Donya as a friend, but then suddenly, she lashes out in a momentary fit of pique. Putnam runs the gamut between “just reading the lines” with Donya and fully becoming Carissa as she does in the car scene with Ali in Act 2. Putnam and Copps have an entertaining and touching moment as their characters bond over their joint concern for Donya’s safety. Copps’ Ali has to adjust to two very disparate times in his life – that of a student, and then later as a damaged, former POW. He is convincing in his portrayal, even modifying his accent appropriately based on his English fluency during each time period. Ron Gasparinetti’s primary set is the apartment with areas signifying the kitchen, living room, and Donya’s bedroom. The kitchen table is shuffled about to become a lobby side table at Ali’s conference and a meeting table in Sally’s offices, both in her real estate office in current time and in her graduate student office in a flashback sequence. The scene changes, though fairly simple, aren’t yet crisp, and hopefully those will speed up as the production continues. As the apartment, the drapes and furnishings give it a warm Middle Eastern flavor. “Nirvana” and “System of a Down” posters adorn Donya’s bedroom walls nicely capturing the adolescent flavor of the space. Gordon and Jeanie K. Smith’s sound design provides a nice touch with Persian music both setting the preshow mood, and covering scene changes. They also employ Googoosh’s mid-1970’s recording of “Gharibeh Ashena” (AKA “Familiar Strangers”) during the story as Kahn intended in the script – all the more powerful given the singer’s 20-year exile by the ayatollahs. Judicious use of Farsi at the end of the preshow voiceover is also nicely done. While predicated on an immigrant family’s experiences and clashes with American culture, audiences can relate to the story as a generational culture clash as well as any parent dealing with adolescent rebellion can attest. “Familiar Strangers” is indeed familiar and is well worth seeing. When: Continues through 18 March, Thursdays-Saturdays at 8PM, Sundays at 2PM. See http://www.thepear.org or call (650)254-1148 for tickets or more information.